Before I finally decided to write a blog I was always toiling on the how, what and why to write about or what to say that people would actually want to come here. I have been active in the past on some great forums on props and statues like therpf.com. I would get many positive responses on my work and many questions on how I did several projects and the steps I took in getting to the finished product. I was happy to offer any answers at anytime–no secrets here. Then it dawned on me to just start a website and blog that would showcase my large body of work and continual projects. 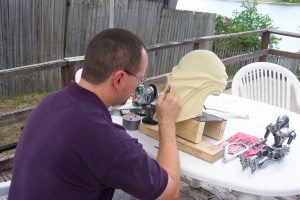 So my goal is to offer future posts giving tutorials on molding techniques, sculpting tips and the different media like clay and foam to make your masterpiece from, casting materials like fiberglass or urethane plastic and painting recommendations. Makeup and special makeup effects (spfx) was my first passion so you bet I’ll be talking about it and offering resources, and believe it or not, beauty makeup advice. Beauty was the first requirement I had to learn in the makeup school I went to at The Joe Blasco School of Makeup Orlando Facility. 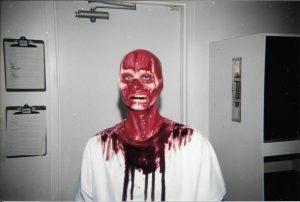 Final project in makeup school inspired by Hellraiser. I’ve always had the passion for holiday decorating particularly Christmas (and, yes, Halloween) and since the inception of Pinterest to the internet I found myself hovering there for hours on end getting ideas and coming up with my own pins. So future blogs will be pinned there of tutorials on my Life Size Nutcracker and other Christmas decorations I conjure up and future Jack-O-Lanterns I carve. 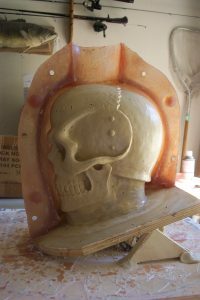 In conclusion, I’m not really selling anything here, but perhaps a final goal can be to write a few eBooks on mold making, sculpting and casting once I drum up enough blog posts on the subjects. Until next time, I hope you enjoy browsing here for a while and feel free to contact me with any queries you may have. Bye! Excellent JP,I’ll be following your progress. Thanks Larry, I’m happy you came here. So much of what I’Ve learned is a direct result of you taking me under your wing as an artist. I can’t express enough how much I’m greatful to your friendship. I’m glad everyone can read this response and see how important you mean to me.